Published: Jan. 21, 2019 at 01:29 a.m. The participants of Super Bowl LIII have been decided, but not before two amazing overtime finishes in New Orleans and Kansas City. Take a look at some of the best photos of the best players of the 2018 Conference Championship games. 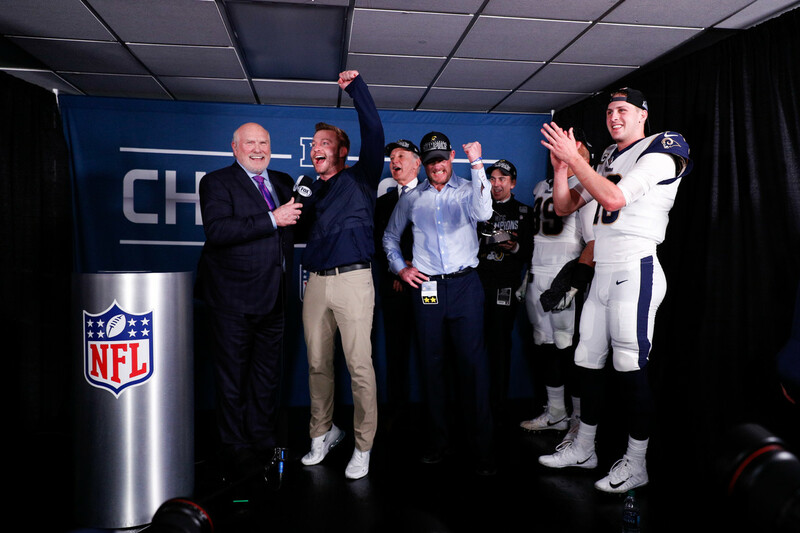 Los Angeles Rams head coach Sean McVay celebrates in the locker room with broadcaster Terry Bradshaw after an overtime victory in the NFL football NFC championship game against the New Orleans Saints. The Rams won 26-23. New Orleans Saints cornerback P.J. Williams (26) celebrates after a play against the Los Angeles Rams. Williams finished the night with eight tackles and one pass defended against the Rams offense. Kansas City Chiefs wide receiver Tyreek Hill (10) jumps to make a 42-yard catch against New England Patriots defensive back Keion Crossen (35). New England Patriots quarterback Tom Brady and Patriots owner Robert Kraft embrace in the locker room after defeating the Kansas City Chiefs in the AFC Championship Game to advance to their second Super Bowl in three years. New Orleans Saints quarterback Drew Brees, bottom, is sacked by Los Angeles Rams defensive tackle Ndamukong Suh during the first half of the NFC Championship Game. Kansas City Chiefs defensive back Eric Berry (29) gestures down the field after a fourth-down stop against the New England Patriots during the AFC Championship Game. With 2:07 left in the fourth quarter, New Orleans Saints receiver Ted Ginn catches a 43-yard pass in front of Los Angeles Rams defender Lamarcus Joyner during the NFC Championship Game. Kansas City Chiefs defensive back Eric Berry (29) attempts to tackle New England Patriots tight end Rob Gronkowski (87) as defensive back Daniel Sorensen (49) leaps to avoid contact during the AFC Championship Game. Los Angeles Rams defensive back John Johnson intercepts a pass during overtime of the NFC Championship Game against the New Orleans Saints. New England Patriots quarterback Tom Brady (12) is lifted up by teammates on the field following an overtime win against the Kansas City Chiefs during the AFC Championship Game.